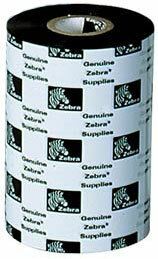 The Eltron Ribbons has been renamed to the Zebra Ribbons. A performance resin product with excellent print quality durability and chemical resistance on a wide range of substrates from coated papers to gloss synthetics. The 5095 ribbon requires lower burn temperatures than other ribbons in its class. This ribbon is an excellent choice for high-density codes and high-resolution graphics. The 5095 can print Z-Ultimate products at speeds up to 8 inches per second. UL Recognized and CSA Component Acceptable (for normal use) when used with Zebra's Z-Ultimate 3000 White Z-Ultimate 3000 Silver and Z-Xtreme products. 3200 Performance Wax-Resin, (4.33 inch x 244 feet), single roll. Also available as a case (Part# 800130-104). 5319 Performance Wax, (4.3 inch width x 244 feet, 12 roll case). Also available as a single roll (Part# 800130-004-R). 5319 Performance Wax, 2.24 inches x 298 feet, 12 roll case). Also available as a single roll (Part# 800013-002-R). 5095 Performance Resin, (3.30 inches x 298 feet, 12 roll case). Also available as a single roll (Part# 800007-003-R).